Do you have a pen pal? Have you ever had a pen pal? Probably not. Writing to a an anonymous correspondent used to be a popular hobby. Not anymore. It has fallen out of favour these days as people spend more and more time on social media websites. Perhaps, you don’t even know what a pen pal is and why it became as popular as it did. A pen pal is a person with whom one exchanges letters on a regular basis. Pen pals usually begin as strangers who live far away in a foreign country, making face-to-face meetings impossible or unlikely. People start exchanging messages with strangers for a range of reasons. The most common reason is to practice reading and writing using a foreign language. As such, people exchange letters to get meaningful practice in a language they are trying to learn or trying not to forget. In the process, correspondents learn about each other’s life and culture, often sharing personal details about themselves. It is worth noting at this point that whereas individuals can keep in touch with each other using email or an instant messaging application, many prefer to use snail-mail. There is something satisfying about seeing your name handwritten on an envelope. Using the postal service makes it possible to trade postcards, photos, stickers, birthday cards, drawings, and collectible stamps through the mail. Nevertheless, there are a number of websites that offer safe, structured, online pen pal exchanges for those who want to correspond with others over the internet. Pen pal writing is beneficial in several ways. Foremost, it allows people to have a different outlook on the world. They can learn how people from different cultures approach questions of housing, schooling, food, exercise, healthcare, technology, travel, and entertainment, among other things. By sharing the ordinary details of their lives with others, correspondents often create long-lasting friendships. Given the fact that pen pals interact with a person they are unlikely to meet, they quickly open up and divulge intimate details about themselves. Not only do pen pals not only create a trusting friendship, but they also promote greater mental health. After all, it is by sharing our secrets that we discover that we are not alone and that all our secrets are basically the same. Furthermore, pen pal writing does away with the prejudices about people from different cultures. It creates a sense of social cohesion across borders and languages, and it creates tolerance through openness and respect. Many pals benefit from creating a written record of their memories, enjoying a chance for deep reflection about their lives, and the opportunity to develop their writing skills in the process. It is an enjoyable writing activity. It is social in nature, unlike other forms of writing such as essay writing or keeping a diary. 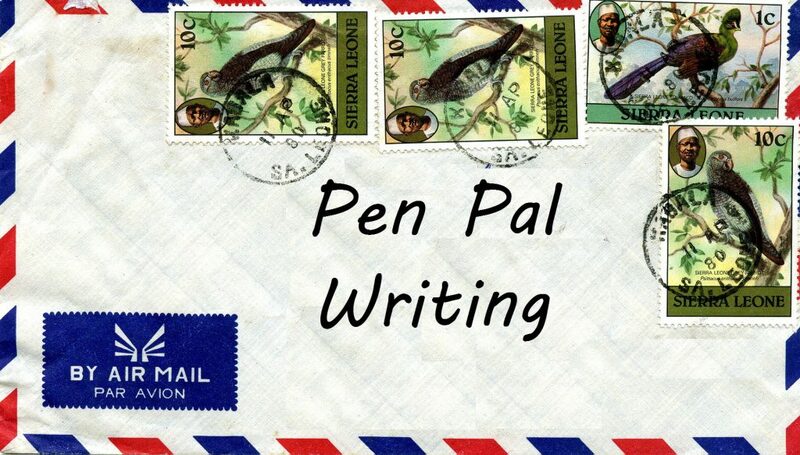 Despite the many benefits of pen pal writing, there can be disappointments and risks. The first one is that it can be frustrating to wait for a response from a correspondent. Some letters take a while before they are delivered, creating a sense of impatience and disappointment. Furthermore, the responses you receive may not always be friendly. In rare cases, a correspondent can take advantage of the anonymity of the exchange and write insulting attacks on certain sexual orientations, cultures, and lifestyles. Personal details revealed by the writer can be shared with other people, which can in turn create security issues. This is particularly true in the contemporary world, in which identity theft and other criminal acts are on the rise. Social insurance numbers, banking information, credit card numbers, and passwords should never be shared with pen pals. Regardless of the need for some caution, pen pal writing is a fun and enjoyable activity. It allows people to interact, learn, and grow. If you would like to find an online pen pal and exchange with people safely while improving your language skills, visit VirtualWritingTutor.com. Membership is free, and there are people who are eager to meet you from all over the planet. Start an Exchange project for students on the Virtual Writing Tutor. For instructions on how to create an exchange for your students, check out these step-by-step pen pal exchange creation instructions for teachers. Learn about the pedagogical value of letter writing exchanges here. Click here for an article on pen pals that students can read to introduce them to the concept.